Cape Town - The Presidency said on Tuesday it welcomes Statistics SA's finding that GDP growth in the fourth quarter of 2017 reached 3.1%. "While GDP growth remains subject to a broad range of market factors and can fluctuate based on such factors, the fourth quarter improvement should motivate all South Africans," the Presidency said in a statement. "It is also a very appropriate accompaniment to the positive sentiment with which South Africans and the global community are embracing South Africa’s current renewal." The South African economy grew by 1.3% in 2017 compared to 2016 and following an increase of 2.3% in the third quarter of 2017. The annual growth exceeds National Treasury’s expectation of 1% growth announced during the National Budget Speech in February, Statistics SA said on Tuesday. "In a time when good news seems hard to come by, the latest gross domestic product (GDP) results provide some cautious cheer," Stats SA said in a statement. "After a wobbly start to 2017, which saw economic activity contract in the first quarter, the economy saw sustained growth for the remainder of the year. The fourth quarter experienced the highest growth rate of 2017, with the economy expanding by 3.1% quarter-on-quarter - seasonally adjusted and annualised." The strengthening in economic activity over 2017 was partly driven by an agriculture industry bouncing back from one of the worst droughts in recent history. A bumper maize crop and recovery in other agricultural commodities saw agriculture production rise by 17.7% in 2017 compared with 2016. The finance and mining industries also contributed positively to GDP growth in 2017. Mining’s growth was spurred on, in part, by increased production of manganese ore, chrome, and iron ore, according to a recent article by Stats SA. Rising demand for minerals used in the production of steel contributed to these increases. Focussing specifically on the fourth quarter of 2017, a rise in the production of animal products saw the agriculture industry continue its buoyant performance, recording a 37.5% quarter-on-quarter rise in production. The trade sector was the second largest contributor to economic growth in the fourth quarter, mostly a result of a rise in activities related to retail, wholesale and motor trade. Nominal GDP in the fourth quarter was estimated at R1.21trn (for the whole of 2017 the estimate is R4.65trn). Expenditure on GDP grew by 3.1% in the fourth quarter, with positive contributions to growth coming from consumption, investment and net exports. The 4.3% rise in manufacturing was largely driven by increased production of products in food and beverages, petroleum, and basic iron and steel. Despite mining’s increase for the year as a whole, the industry saw a quarter-on-quarter decline in the fourth quarter, largely driven by a fall in the production of gold and platinum group metals (PGMs). "With South African economic growth having exceeded expectations in 2017, all eyes are now on 2018. National Treasury expects growth of 1.5% in 2018. 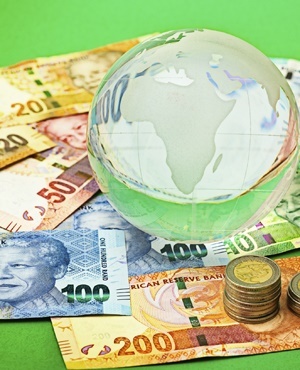 Only time will tell how the economy will fare compared with this forecast," said Stats SA. Fin24 reported earlier on Monday that Finance Minister Nhlanhla Nene told the Federation of Unions of South Africa (Fedusa) members on Monday that the government will continue to hold talks with stakeholders in a bid to soften the blow for the poor from the impact of the VAT increase which comes into effect next month. The funds from the VAT increase will go toward plugging a revenue shortfall estimated at R48.2bn for this year. He indicated that government will be looking at expanding the list of zero-rated goods. Nene's appointment last month in a Cabinet reshuffle by President Cyril Ramaphosa marked Nene's return to the portfolio he held for nearly two years before he was fired by then president Jacob Zuma in 2015. Nene also told delegates his department would move swiftly to resolve "governance and operational failures" at state-owned enterprises, particularly in Eskom. The governance of state-owned enterprises has often been raised by ratings agency as a key area of concern affecting economic growth and good governance. Nene said ratings agency Moody's was currently in the country to discuss monetary issues. National Treasury will probably raise projections for economic growth this year in its October mid-term budget as the country overcomes governance and financial problems that have lowered confidence, according to Nene, Bloomberg reported earlier. Policy uncertainty and state graft concerns saw Fitch Ratings and S&P Global Ratings lower their assessments of the nation’s debt to junk. The economy is forecast to expand 1.5% this year, compared with the previous projection of 1.1% and an estimated 1% in 2017, National Treasury said in its 2018 budget review on February 21. Growth will probably accelerate to 2.1% in 2020 as measures aimed at creating policy certainty and attracting investment pay off, it said.